1. PMS changes in a regular pattern when the environment changes in a regular pattern. Although it is possible to infer past or future PMS levels from a single measurement, it is better to make a series of measurements to discover how the PMS is changing. 2. Knowing the PMS level is useful only if it can be related to a physiological or growth process of the particular plant. For example, an important level is the PMS at which photosynthesis begins to be inhibited, or the PMS level which results in a reduced yield per acre for a particular crop. Extrapolation of physiological response from one species to another is risky at best, but some generalizations can be helpful in getting started in the right direction. Following are some guidelines to interpreting PMS. PREDAWN (or daily minimum) measurements of PMS range from 1.5 bar for plants in saturated soil and under low atmospheric demand to 60 or more bar for desert plants with almost no available soil moisture. The PMS of most plants just before dawn, however, will be between 3 and 10 bar. Plants having a PMS of 3 bar are probably not limited by soil water supply, even during the day, and probably would not respond to irrigation, Plants having a PMS of 10 bar are probably limited in certain physiological processes. These processes will become even more limited during the day as the PMS increases. As the PMS exceeds 10 bar (predawn) the plant becomes more severely limited until it shuts down and eventually will die if it does not receive water. The complexity of the interaction between the environment and plants emphasizes the need to measure the PMS not only at the predawn minimum, but also at times when the PMS is higher. 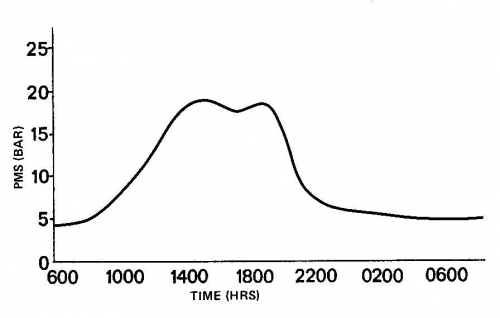 MAXIMUM PMS occurs during the day, usually when the solar radiation is maximum (early afternoon). A series of measurements taken during the day, is useful in determining when the maximum PMS occurs and when it should be measured (i.e., when the PMS is changing slowly). A maximum PMS of 7 bar does not limit the physiological processes of most plants. The degree to which PMS above that level limits plant functions depends upon the plant species. Recognizing that large variations occur from one species to another, a general rule may be formulated that as the PMS increases from 5 to 17 bar, plants become more and more limited in their ability to grow. This is the range in which photosynthesis, cell elongation, and phloem transport become reduced, sometimes abruptly. If a plant has a PMS above 20 bar it will usually wilt, as is the case with most herbaceous plants, or shut-down, as is common with woody plants. As PMS increases above 20 bar plant vigor declines. Some time before the PMS reaches 100 bar most plants die. The ability of plants to survive conditions under which their PMS exceeds 20 bar is highly variable between species. SEASONAL CHANGES are described by making weekly or monthly measurements. PMS may change even though there are no environmental changes because physiological and morphological changes can modify a plant’s response to its environment and hence change its PMS. 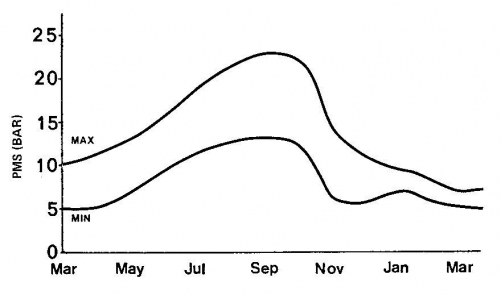 Pressure/volume measurements (described in a subsequent section) can be made periodically to show seasonal changes in important physiological measurements, such as turgor pressure, osmotic concentration, and water potential of the plant.